Who is a better cook at your household? Be honest. And we are not talking about baking for pleasure, but some serious heavy duty cooking. 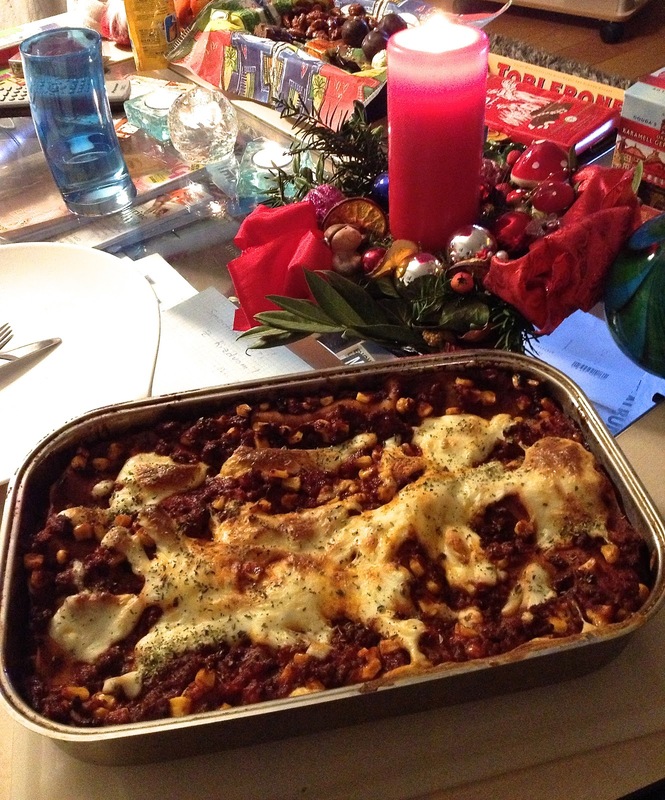 When it comes to a home made lasagne, the answer in this particular household is pretty obvious (you guessed right), and we are happy to share the recipe for this mouthwatering dish in our first post of the new 'when HE cooks' theme. We would love to hear about your favourite recipes mastered by your boyfriend, husband, Dad, brother or friend, either via the Comments field under this post or on our Facebook page. In a large saucepan, warm up 0,5 dl olive oil + half clove of garlic + chilli oil, at a high heat. Add 400-500 g minced meat (8-12% fat) at a medium to high heat and cook until browned, then pour about 1 dl red wine and cook until the wine is absorbed. Later on add 250 ml tomatopaste/sauce and a can (500 ml) minced (hakkede in Danish) tomatoes, plus 200 gram sweetcorn. Continue cooking, and add salt, oregano, ground pepper and chilli to taste. Stir well for 5 min and then let it simmer at just below medium heat for about 30 min. Meantime, warm up the oven to 180C. Melt 50 gram of butter; once it's ready, add 3 tablespoons of flour. Let the butter bubble up and stir well for a minute. While stirring it, slowly add 0.5 liter of high-fat milk (3,5%) (be careful it is not too hot or the milk will get burned!). Continuously stir, well until the sauce gets smooth. Now, place the pasta (lasagne) sheets in a medium size rectangular baking dish (deep-ish). In our case we had three layers of pasta sheets. Layer three: the last of the pasta sheets, 20% of the meat sauce and the rest - 50% - of the béchamel. Pop it into pre-heated oven and bake for 30 min.